Our ‘surf’s up’ theme for the convention. Don Dulin with Bob Schenck. It’s always good to get out of town for a few days, and when you’re going to see 4-500 or your closest friends, it is even that much better. Leslie and I have been attending the AWBD Convention for many years. She’s the CFO with a flair for decorating our booth. I just stand around and answer questions or show our demo. Year after year, we see many of the same faces. 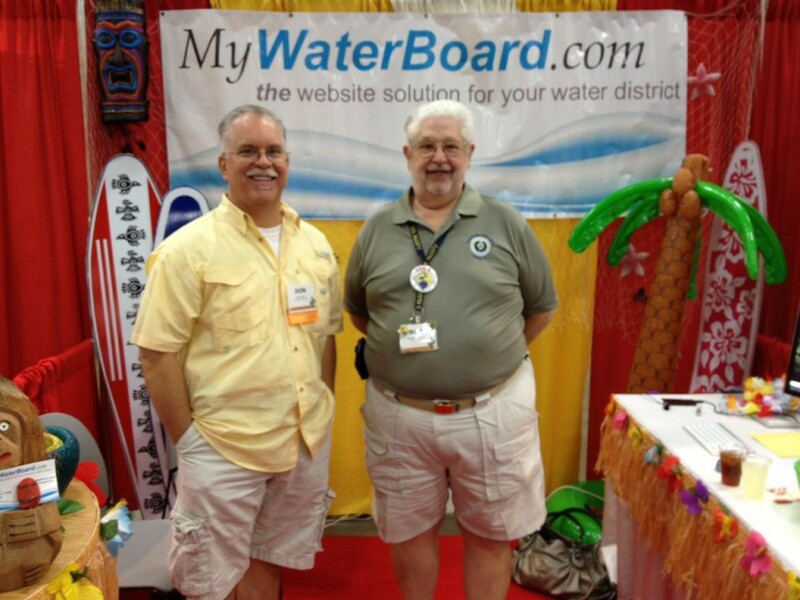 Friends we know from our Fort Bend County roots, others we know as clients, and still others that are working on getting board approval for their very own website. It’s always fun catching up with the regulars. It’s like a family reunion of sorts. This year is no exception, except that we may be redesigning our booth. Along with redesigning our website and redesigning our business model to include some new and innovative tools for our Water District clients. We hope to see you there, and look forward to working and playing a little on the Texas Riviera. Until then, God bless Texas and our U.S. of A. ← Here’s OUR new website… where’s yours?